My first night camping! My tent is pitched (hung) and my little stove is fired up, cooking a meal of ramen noodles and sardines. I am proud and happy. 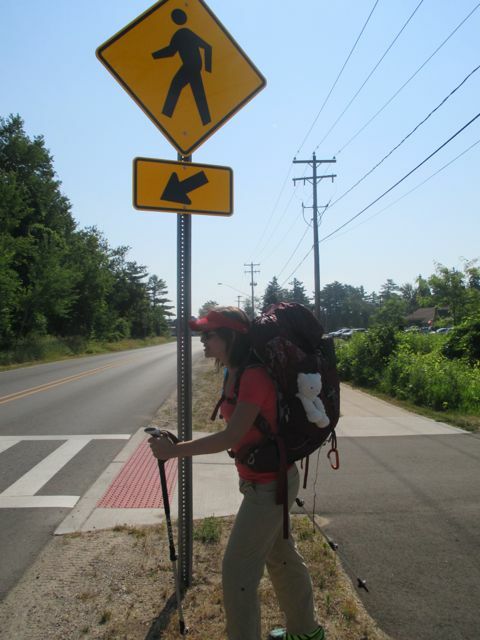 Yesterday I was “in training”: hiking the 20-some miles from Sutton’s Bay to Traverse City. The first casualty of procrastination is sleep, and I lost almost all of it the night before last as I tried lamely to prepare for whatever it is I am now attempting to do. I sat in the middle of a room with my gear all around me and tried to make sense of it all. There was packaging everywhere, since pretty much everything was brand-new and I figured out what to put where and if it would all fit while half-watching an old movie with mom. The next morning, I woke up ready to go and utterly fearless. I think it was a mix of excitement, shock, determination and sleep deprivation, but my brain was laser-focused on “this is it!” I thought of leaving directly from the rental house that my family was staying at, even though the is no trail for 10 miles from there, but that extra distance would have made it too hard for me to get to Traverse City in one day, and it would also have meant walking down the same road that my family would later drive down, and there is something about that picture that would definitely have killed mom. So, we ended up all leaving together- me, Mom, Dad, Nikki, and Sarah. They drove me to my trailhead at Sutton’s Bay, and pulled over on the side of the road at my trailhead. After some surreal goodbyes, I started walking and they drove away. Immediately after departing I struggled to entertain my mind. I’m used to having my computer and phone with me constantly. It felt strange to have no plans to make and no work to do. Eventually, I got tired enough that my brain dimmed and the boredom no longer mattered. I even closed my eyes for a few paces at a time because I was so tired and the road was straight. There’s something helpless about the start of a long trip- with no buffer between what I’ve done and what I’m working toward, how can I justify this boredom, this exhaustion, this discomfort? I’m justified in being tired after walking many miles in the heat, with no sleep, but the trail ahead of me feels like a long “to do” list and I’m still sharpening my pencil. I remember a similar feeling at the start of long runs in high school cross-country, already tired with so far to go, but I also remember that, when I continued running, the feeling went away and I got my stride. I hope that with every day of this hike it will become easier. This is all part of my theory about training my brain. I think of my mental pathways as trails– some better traveled than others– but by tramping down the overgrown paths, they become ever easier to follow, while the shortcuts and bad habits become grown over and one day become harder to take than the others. Both routes may always be available, but doing the right thing can become easier. For 10 years I have lacked self-discipline around food. The path to giving in to bulimia became so well-trodden it was nearly impossible for me to avoid. Even when I abjectly did not want to succumb, I would find myself on autopilot, suddenly driving down that depressing 10 lane highway. These past few years I have broken ground on that old route, where my body chooses and not my mind, and it’s becoming easier, but I still have a long way to go. This trip is about discipline. It’s about being accountable to myself. It’s about mindfulness and thoughtfulness and learning as I go. I’m not there yet but I’m on my way and finally I’m on the right path. I don’t know if, by the end of this trip, I will be “better.” I really want to be. I want this to be my cure. Old world therapy in nature, healing driven by reflection and solitude. If nothing else, I hope I can get better at getting better, beating down those old paths one day at a time. Two days before I started walking, I officially changed back to my “new old name.” Once again I am Michele Marie Oberholtzer. The timing could not have been better. The divorce was finalized just over a week ago, and I kept those papers with me while everything else went into storage. Three days ago, I went to a tiny Secretary of State office in Sutton’s Bay and made it official. My new ID will get mailed to me somewhere along my trial. I decided to get the “Enhanced License” that serves as a passport for Canada because my plan is so not a plan, that it seems completely possible that I’ll want to skip over a border. It’s crazy to this that I only made the decision to do this trip six weeks ago. It was an insane amount of work to leave New York and quit my job and prepare for this trip in that short time, especially since so much is just outside my control. When those papers came in the mail, wow, it made everything possible. I got my identity back just in time to figure out who I am. Last night, I made my way into Traverse City. I watched the 4th of July fireworks, exhausted on the public beach. I stayed the night with family friends Larry and Mary, slept a good 12 hours, ate breakfast, and got dropped off in town. They gave me a gift that has already become a prized possession. 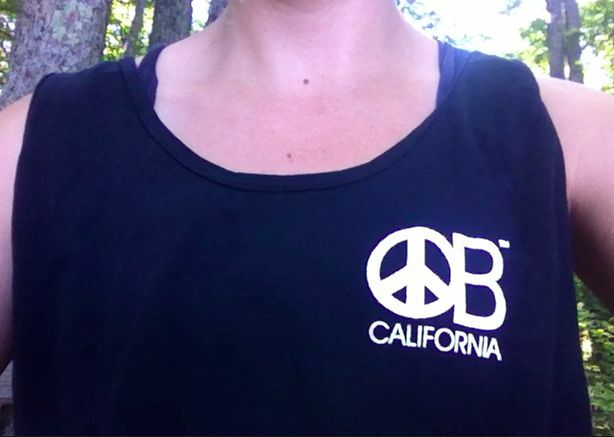 It’s a baggy black cotton tank-top with an emblem in the upper left that says “OB.” Really, it’s a cheap touristy shirt from Ocean Beach, California but “OB” sounds like “Obie,” and “Obie” is short for Oberholtzer. I’m tripping over myself for how perfect it is. I shouldn’t carry an extra shirt and conventional wisdom strictly forbids cotton on the trail, but I already know this shirt this is coming with me all the way. Since I designated yesterday as “training,” today has been a day of rest and last-minute planning. I only had to walk the 5 miles or so from Traverse City to the campground, so I’ve taken my time. My first stop in town was to a hardware store where I tried to buy one outstanding item on my shopping list: a “poop shovel.” They didn’t have anything light enough so I wandered down the aisles trying to find a scale I could stand on to weigh my pack. My crass request must’ve made me seem like an unsavory character and they had a staff member eyeing me cautiously enough that I lost my nerve before I got on the scale. With food and water, I’d guess it’s easily over 40 pounds, but I truly have no idea. In a way, I like not knowing. I’m going to carry it no matter how many pounds it is, right? Just a few days ago, I drove to this town to buy a few things at an outfitting store. I asked the manager, a man named Sandy, to help me pick out a backpacking pack. He gave me a skeptical look– I was drinking a latte and wearing a skirt– and said, “No offense, but are you going hiking or are you going backpacking?” “Backpacking,” I told him “definitely backpacking.” I know that I looked like an unlikely candidate and it was difficult to answer his inevitable follow-up questions (how much experience I had– “none”– and how soon I would be leaving– “now”) but I know what I’m doing even if he doesn’t. I ended up buying over $1,000 worth of merchandise, including a new pack and a down sleeping bag. Before I left, Lance told me “Take care of yourself, and don’t be cheap.” I guess I was thinking of that when I mindlessly followed Sandy’s recommendations of all the best products. If I fail at this, it won’t be because my sleeping bag wasn’t up to par. I stopped back in the store today to make an exchange and to see if I needed anything else, since this will be the last store of its kind for perhaps my entire trip. In the truest sense of the word, these guys had “outfitted” me and it was funny to walk back in the store today with all of my new merchandise on my back. They all wished me well and I left. Now I realize I forgot to buy a poop shovel. After the shopping trip, I went to the movies alone for the first time. The other night I read an article by Michael Moore about the community movie theatre in Traverse City, which he had help to restore. It sounded nice and I had nothing better to do, so I took myself there. It’s the kind of thing I would never do in my normal life but it felt really great. I wasn’t embarrassed to be seen by myself, wasn’t desperate to be approached– I was just content. I didn’t feel alone with my backpack sitting tall in the seat next to me. 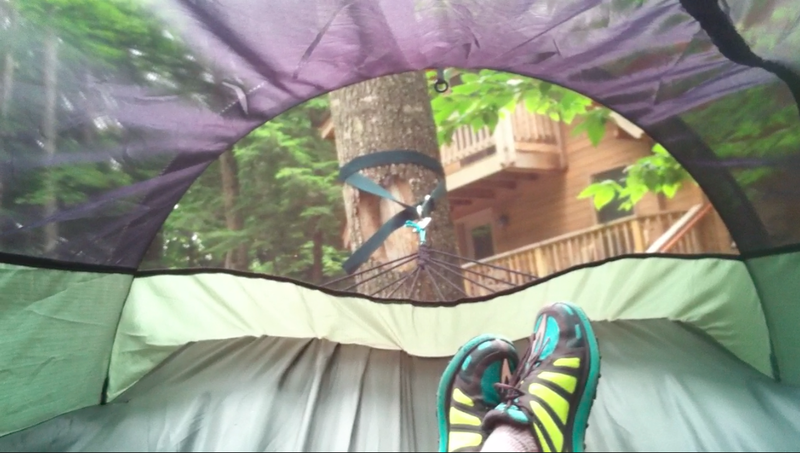 Tonight I am using a lot of my gear for the first time– my stove, this journal, my sleeping bag and hammock tent. When I set up camp, I had an overwhelming sense of fulfillment. I am filled with the joy of doing. It actually makes me feel like Dad, always occupied with something. With my bag on my back I feel purposeful and strong. I’ve thought of a lot of people and what I want to say to them. To Christina, how I remember our conversation at the Thanksgiving Turkey Trot; how I had the feeling that I’d lost the discipline that running used to give me and that I didn’t know how to get it back; how she inspired me to aspire to keep the promises I make to myself. To Ben, how I really did love him and though I don’t anymore, how he will always be hugely influential to me. To Kyle, how I imagine us together in a little house in Detroit, maybe with my grandma, and how I wonder if maybe we could be in love someday. To Mom, how I wish she would stop doubting herself; how I want her to break out from that victim-martyr tragic soul and to live the way she wants her daughters to. Strangely, I have nothing to say to Lance, thought it’s occurred to me a hundred times already just how different this would be if he were here and how much I appreciate doing something on my own the way I always wanted to but never knew if I could. And to Cheryl Strayed, for inspiring the hell out of me to do this. This entry was posted in Left of East and tagged leelenau, Leftofeast, michigan, north country trail, sutton's bay, traverse city. Bookmark the permalink. ← Are We Capable of Us?